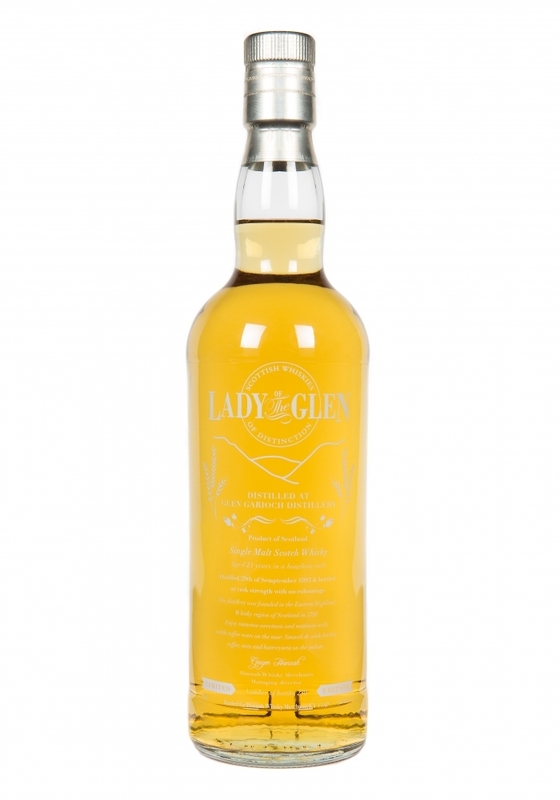 After pouring this Clynelish into your glass, aromas of rich vanilla evolve into cooked banana and toffee. This soft creamy dram coats the palate with dark honey beautifully accompanied by a wave of sweet spice. Distilled in 29th October 1997 and bottled in 1st September 2015. Cask number 12363 was aged for 17 years in a bourbon cask and retains a cask strength of 54.9% alc. The cask yielded just 267 bottles. 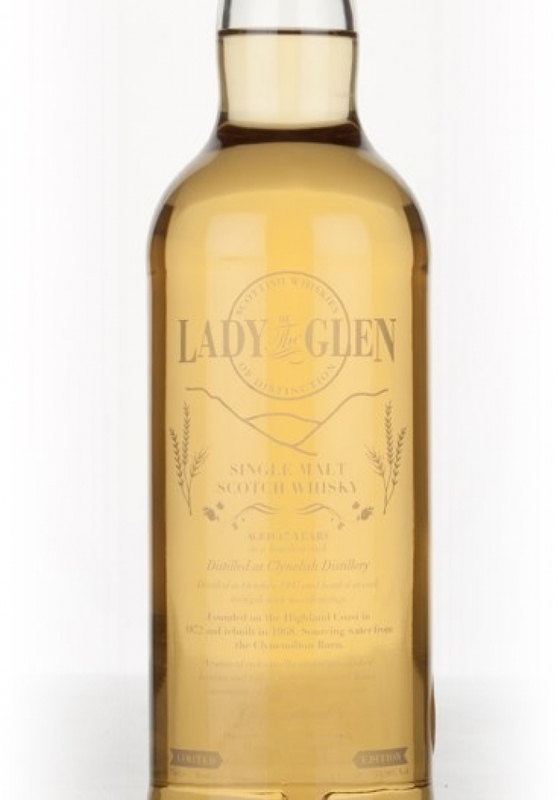 Presented in the unique Lady of the Glen pouch each glass etched bottle is individually glass etched and numbered. (N) Caramelised Banoffe, Thick waxy Vanilla. (P) Soft, creamy & light. Honey on toast, rolls through to vanilla custard & sweet spice. The coastal distillery of Clynelish located in Northern Highlands was constructed in 1968 although its roots go as far back as 1819 when the original distillery was founded by the Marquess of Stafford, and that distillery is now named Brora. Rumoured to have been founded to retain the market from local smugglers, the official reasoning was to take advantage of the local fertile land to support new farms. The distillery’s uniquely coastal flavours are derived not just from its location but also from its practices. They still use barley that is malted in the Northern Highlands and the water is taken from the Clynemilton Burn located a few miles north of the distillery. The cost of delivery is included in the price and delivery to anywhere outside the UK will cost an additional £20.00. 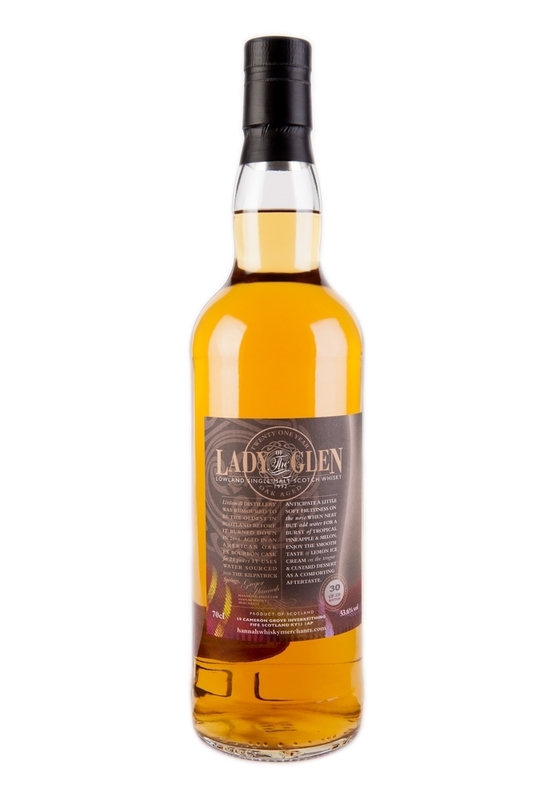 Your bottle will also include a complimentary sample of another Lady of the Glen release. In 1779 the Bowmore distillery became the first licensed distillery on Islay of the Inner Hebrides, making it one of the oldest legitimate Whisky distilleries in Scotland. A host of owners have controlled this distillery since its inception including John Simpson, William & James Mutter, Sherriff's Bowmore Distillery Ltd, William Grigor & Sons Ltd. In 1963 Stanley P. Morrison ltd bought the distillery and increased the number of stills to four and provided further investment. However, it was in 1994 that the Suntory buyout took place which brought the distillery under Japanese ownership. The distillery's iconic white buildings sit facing the Atlantic Ocean while the water source is from the winding Laggan River that meanders through peat bog and moss of Islay. The traditional methods of Whisky making still maintained by the distillery have ensured a consistent high quality of liquid that has gifted Bowmore among the finest reputations for Whisky. 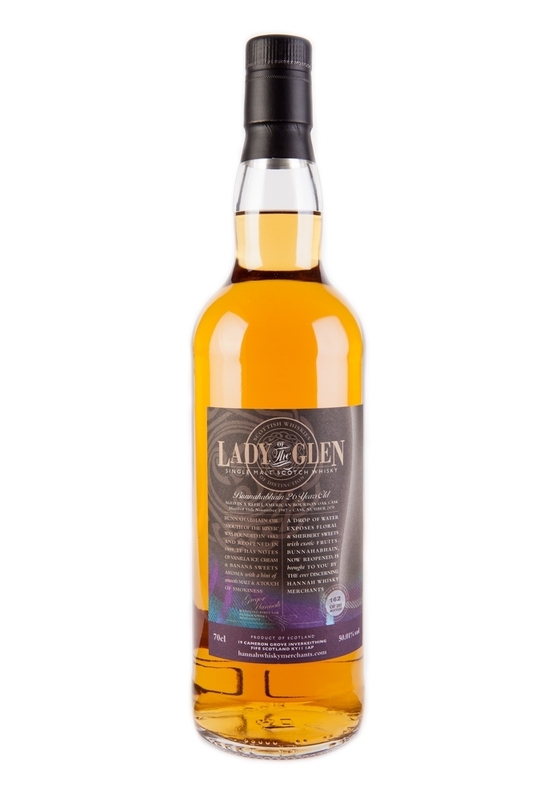 Lady of the Glen is proud to release this limited edition 10 bottle only Sherry Cask release. The cask was among the last private cask to be filled while the Morrison’s owned the distillery before the Suntori buyout. Each etched glass bottle is gifted in a dovetail oak box and delivery has been included in the price with exception to orders outside the UK where there is a £20.00 additional charge. 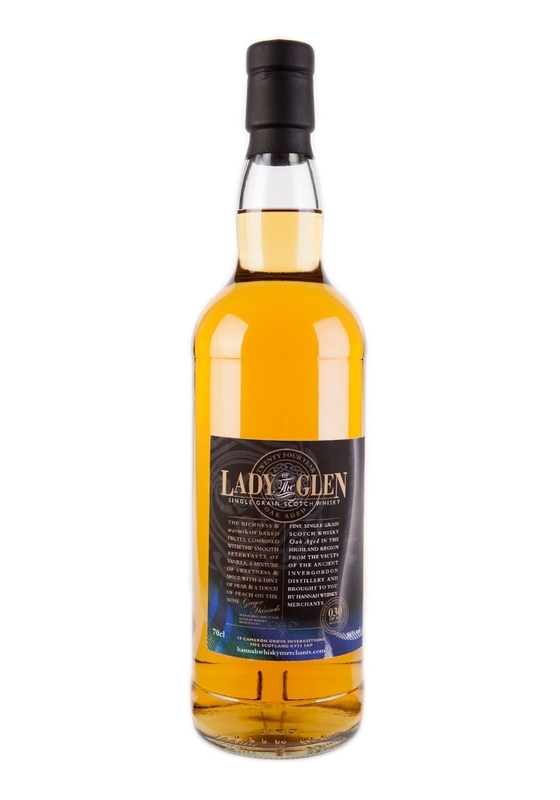 Please note, the bottles are 75cl releases unlike previous Lady of the Glen releases. Immense Sweetness and nuttiness with subtle toffee, this single cask from the ‘Old Meldrum’ distillery is a sweet tooth delight. Distilled 1993 and aged in a bourbon cask for 21 years. Cask number 798 yielded 250 bottles at natural cask strength 56.4%alc. From the 'Old Meldrum' distillery located in the Eastern Highland's of Scotland, although it is better known as The Glen Garioch distillery. Built by Thomas Simpson in 1797 it sits within the Highland Whisky region. In being built in this time it sits among only a small group distilleries founded in the 18th Century. The distillery sources its water from the springs on the nearby Percock Hill. Glen Garioch, pronounced Glen Geery, has been through a multitude of owners as would be expected for a distillery with such a long history. It was mainly utilised for blending purposes, whereby its spirit would contribute to popular blends of the time such as the VAT69 blend. However, in 1968 the distillery was closed and it lay silent until 1973 when it resumed production under the new ownership of Stanley P. Morrison ltd, unfortunately Stanley did not get to see the opening as he passed away in 1971 a year after officially taking over the distillery. The distillery was upgraded to increase capacity and production methods were improved too, the distillery also began to release its own single malt bottlings. The distillery was closed again in 1995 by new owners Suntory only to be reopened again in 1997 now with a less peaty taste profile. Despite the tumultuous history Glen Garioch presents itself now with a premium spirit rich in history. Our Limited Edition Glen Garioch was aged in an American Bourbon cask for 21 years, distilled in 1993 and bottled at cask strength 56.4% alc. The cask yielded only 250 70cl bottles of which only 35 will be available from the website. This single cask release will follow all our previous releases in that it will be non-chill filtered with no colourings. Melon and peach soft fruits with hints of pineapple on the palate and nose. This single cask from an unnamed distillery in the Speyside Whisky region is a truly unique offering. Distilled October 1994 and aged in a refill Bourbon hogshead for 20 years. Cask number 1171 yielded 262 bottles at natural cask strength 52.3% ABV. This Single Malt Speyside Whisky was distilled on the 17th of October 1994 and aged in a refill Bourbon hogshead, cask number 1171. Bottled at cask strength with no colourings added - this is non-chill filtered. Ben Cops', of the Ben's Whisky Blog, had this to say, "Love the nose, lots to discover. Quietly, challenging and quite elegant". Jon, of Scotch and Sci-Fi, summarised his tasting with "Intense on citrus, palate cleansing and pleasing. The background layers of toffee and fudgey chocolate gives this dram some dimensions to explore." Tiger White from the Edinburgh Whisky Blog enthused with "plenty of fruity notes and it slips down rather too easily, even at cask strength"
Tom who writes Toms Whisky Review "HUGE fruity notes...with hints of wood and spice round this off into a cracker of a dram"
Postage is included in the price and you will recieve your order within three to four days of making your order. In the picturesque Western Highlands and next to the highest mountain in the British Isles sits the Ben Nevis distillery, one of the oldest licensed distilleries in Scotland. It is rumoured to have been founded in 1825 by ‘Long John’ McDonald born 1798 in Tolgulbin, who could reportedly trace his ancient family line back to the time of Robert the Bruce. Long John was a famous figure in Whisky folklore because he was one of the first illicit distillers to sell his own Whisky and he was apparently a giant of a man in height, strength and fitness. Queen Victoria even visited Long John’s Ben Nevis distillery in 1848 where she was presented a special cask dedicated to her son, the Prince of Wales, future King Edward VII. Closed in 1986 and fortunately reopened in 1991 under the new ownership of Nikka with the quality of Whisky improving thereafter. The distillery sources its water from Alt a Mhulin which runs from Ben Nevis past the distillery into the River Lochy. This single malt Highland Whisky was distilled on the 3rd of December 1998 and aged in a Refill Sherry Hogshead cask, number 1407. It has been bottled at natural cask strength and there has been no colourings added - this is non-chill filtered. Ben Cops', of Ben's Whisky Blog, described the Ben Nevis as "uncompromising, intense, exciting, balanced, complex and old beyond it’s years"
Jon, of Scotch and Sci-fi, concluded with "sit back, pour, explore, enjoy and relax. Fantastic experience". Tiger White of the Edinburgh Whisky Blog tasted "vanilla, lemon peel, custard creams, cinder toffee, a gingery spice and fresh sawdust"
Tom who writes Toms Whisky Reviews got "Toffee coins and sweet sugary candy notes with oak and malt filled background"
Steve of the Somerset Whisky Blog had "Thick, instantly sweet and buttery, quite a wine like character...a great cask here"
Our first grain whisky. 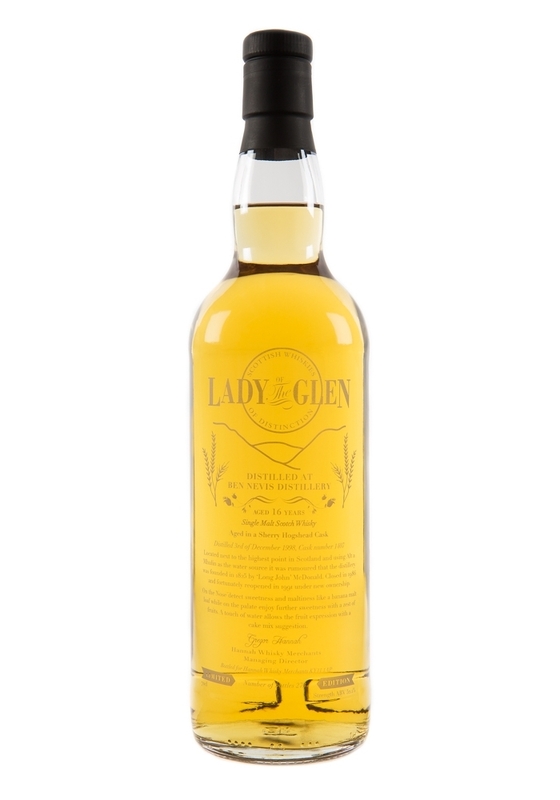 This charming Highland whisky was a personal favourite of the Lady of the Glen team. Well balanced and golden with a fragrance of pear and a touch of peach on the nose. The key note of any decent Invergordon is vanilla and this grain was compared to vanilla ice cream. The richness and warmth of baked fruits, hazelnut with combined hints of pear and ginger gave this whisky a toasty in the mouth sweet and dry finish. With the addition of water you could enjoy a depth of new flavours as it took on a zesty dimension with hints of lemon peal. Charmingly young taste even though it is old. This Whisky was from a single American ex bourbon cask and it was non chill filtered. Bunnahabhain translates from the Gaelic ‘The Mouth of the River’ and it was founded in 1883 on the North of Islay. Built during the 19th Century Whisky boom, there are only around twenty other distilleries in Scotland created during this time which are still active now. Bunnanhabhain is fortunate to be amongst these century old distilleries as it was mothballed it 1999. It did reopen eventually and now actively sells it Whisky. Distilled on the 16th November 1987 and aged in a single refill American Bourbon cask, number 2470. It has been bottled at cask strength and there has been no colourings added - this is non-chill filtered. 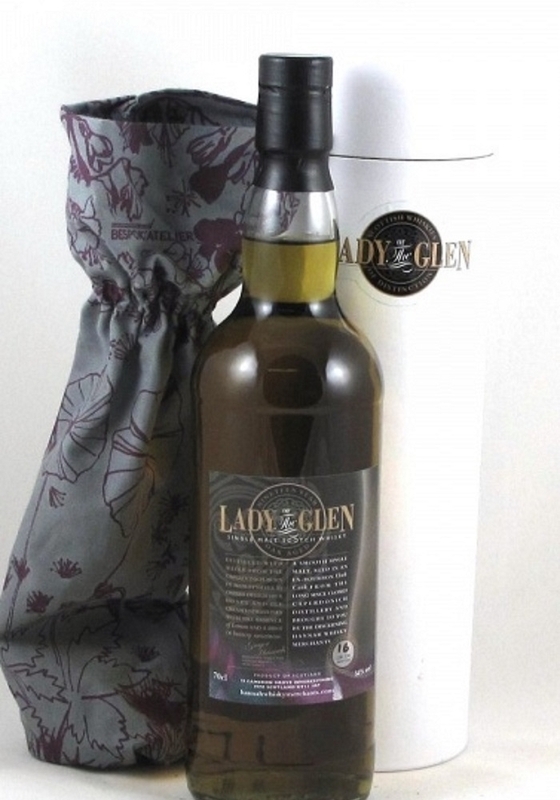 Your uniquely numbered bottle is presented in the Lady of the Glen bespoke gift bag with a descriptive tasting tag and delivery is included in the price. Jonathon Webb of Scotch and Sci Fi described this Whisky as"Intriguing and complex, not for the beginner...a truly unique Whisky"
Adam Warburton of Whisky Diary stated that "This has to be the best Bunnahabhain that I have tasted to date!" Ben Cops summarised it as having "Massive intensity, loads of ripe juicy fruits and citrus"
Tom of Tom's Whisky Reviews tasted "full sherry soaked sweetness and with hints of of peated background popping up"
Steve Prentice of the Somerset Whisky blog suggested "it's got that trademark honeyness"
The Whisky Chronicle summarised the palate as "more fruity with an amazing sweet shop sweetness"
Tiger White of the Edinburgh Blog declared that it was "a great example of a Bunnahabhain - a layered complex nose which leads to an explosive palate"
The Whisky corner duo offerred varied notes on this dram from"so complex, so much flavour packed into one mouthful"
Lady of the Glen's first Lowland malt Whisky. With roots as old as 1750 the Littlemill Distillery was rumoured to be the oldest in Scotland before it burned down in 2004. 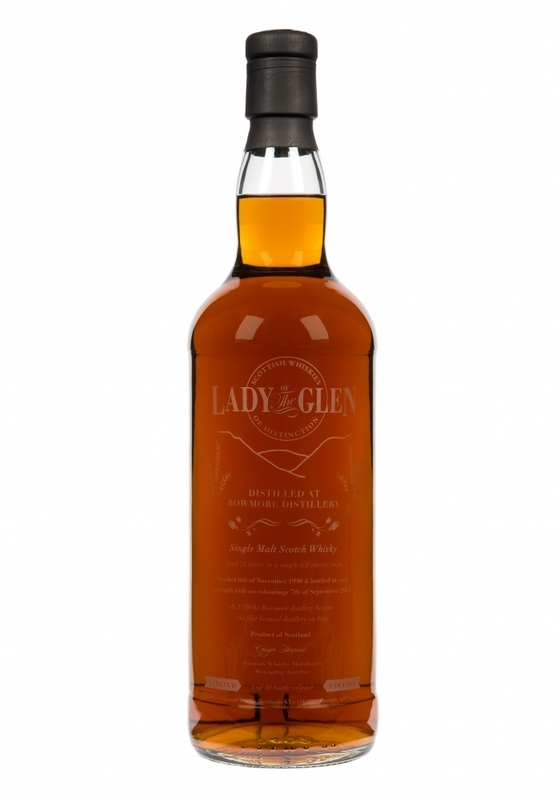 Aged in an American oak ex-bourbon cask for 21 years using water sourced from the Kilpatrick Springs, this malt has a clean colour similar to Pinot Grigio. Anticipate a little soft fruitiness on the nose when neat but add water for a burst of tropical pineapple and melon. Enjoy the smooth taste of lemon ice cream on the tongue and custard dessert as a comforting aftertaste. This Littlemill was from a single ex-bourbon American Oak cask and it was non chill filtered. The cask yielded 309 bottles which sold out May 2014. Tom thought the Littlemill was "a very interesting dram with layers of complexity that work wonders"
The Whisky Corner team said that "(it was) a lovely malt that suprised me"
Jon of the Scotch and Sci Fi whisky blog summarised "a sweetie fan's dram"
Tiger of The Edinburgh Whisky Blog described it as "(having) Lots of fruity juiciness layered with touches of spice and lovely clean citric notes"
Sold out January 2014.From the mothballed Caperdonich distillery in Speyside came this deluxe malt. Aged in an ex-bourbon American oak cask for 19 years and bottled at cask strength without chill filtering or any another additives. Whisky Corner "lovely sweetness, much like a Highland Toffee bar, but one that’s been warmed up in your pocket all day"
Edinburgh Whisky blog "A lovely wee whisky, and a bit of a bargain considering it’s a single cask from a mothballed distillery"
Whisky Journal The review is in German, but a translated segment reads, "The tasting buds are stimulated by citrus fruits and slightly sour apples"